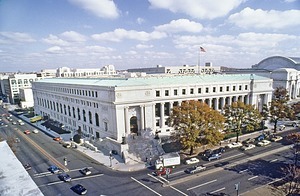 The National Postal Museum was established in 1990 under an agreement between the Smithsonian and US Postal Service to preserve and display the National Philatelic Collection, formerly part of the National Museum of American History. 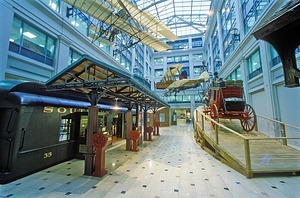 The Postal Museum moved to the Washington City Post Office Building on Capitol Hill in 1993. Exterior of the Washington City Post Office Building, designed in 1914 by Daniel Burnham, located at North Capitol and Massachusetts Avenue. A portion of the lower level of the palatial beaux arts quarters of the Old City Post Office Building became the new home for the National Postal Museum. Opened in 1993, the museum was established in 1990 under an agreement between the Smithsonian Institution and the United States Postal Service. 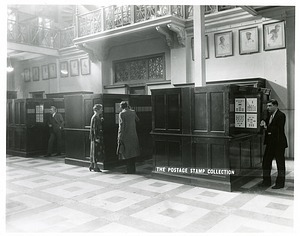 The Postage Stamp Collection on display in pull out trays in the Arts and Industries Building, probably early in the twentieth century. Visitors are looking at various cases. Portrait paintings are visible overhead. 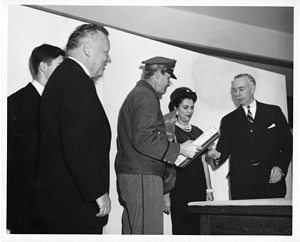 Letter carrier James G. Todd presents to Dr. Leonard Carmichael, Smithsonian Secretary, the package containing the Hope Diamond delivered to the Natural History Building. Pictured from left to right are Mr. Ronald Winston, Postmaster General Arthur Summerfield, United States Postal Service letter carrier James G. Todd, Mrs. Edna Winston (wife of Harry Winston) and Dr. Leonard Carmichael. 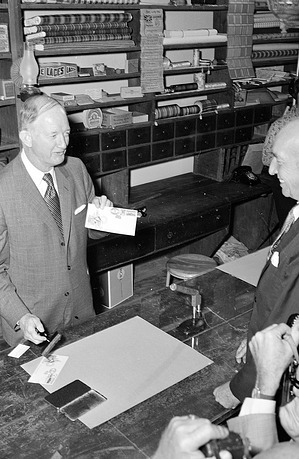 Then Postmaster General Winton M. Blount hand-canceling a letter for Secretary (1964-1984) S. Dillon Ripley at the opening of the reconstructed General Store/Post Office in the National Museum of History and Technology, now the National Museum of American History. 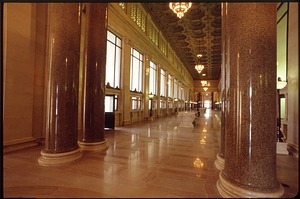 The Historic Lobby of the Old Washington City Post Office Building leading to the new home for the National Postal Museum. A portion of the lower level of the palatial beaux arts quarters of the building became the new home for the National Postal Museum. Opened in 1993, the museum was established in 1990 under an agreement between the Smithsonian Institution and the United States Postal Service. 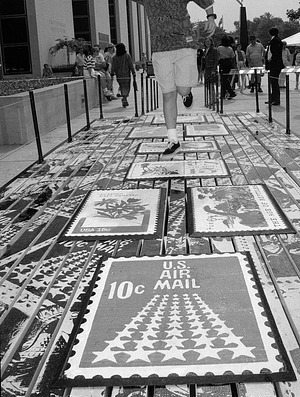 Van Ramey, son of National Museum of American History secretary Joyce Ramey, hops across an art construction featuring postage stamps designed to advertise the new postal museum. On November 6, 1990, Secretary Adams and Anthony Frank, then postmaster general of the United States Postal Service signed an agreement to relocate the National Philatelic Collection, at the National Museum of American History, to a new museum in space allocated by the U.S. Postal Service at the historic City Post Office Building, Massachusetts Avenue and North Capitol Street, N.E. Office of Exhibits Central Modelmakers Lora Moran-Collins and Danny Fielding are hard at work fabricating horses to go with a restored New England stagecoach that was once used to carry mail. The stagecoach, along with a team of horses, will be on display in the National Postal Museum when it opens July 30, 1993. The first of four horses was built with 800 pounds of modeling clay. 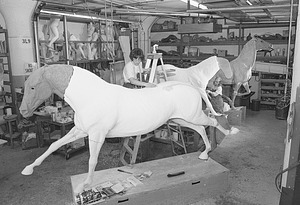 For the other three horses, seen here in various stages of completion, the modelmakers turned to a new technique using Styrofoam. 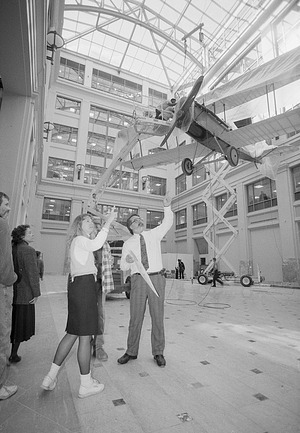 At the National Postal Museum, Director Jim Bruns and bystanders survey the atrium, one of five galleries focusing on mail transportation, as a 1920s De Havilland air mail plane is readied for display overhead. 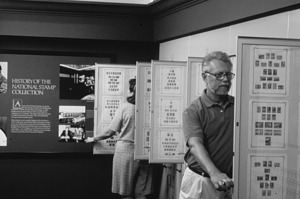 The "Moving the Mail" exhibit set up in the National Postal Museum, located in the Old Washington City Post Office building. 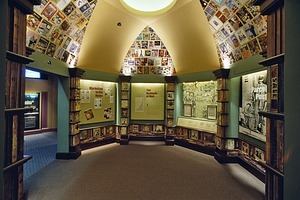 The "Business of the Mail: Parcel Post" gallery installed in the Atrium of the National Postal Museum located in the Old Washington City Post Office Building that was on display c. 1993 to 1998. 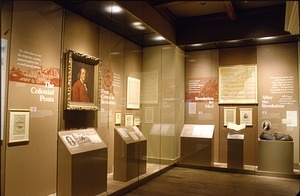 The "Starting the System" section of the "Binding the Nation" exhibit at the National Postal Museum, located in the Old Washington City Post Office building. The exhibit features manuscripts and artifacts from the earliest years of the United States postal system. 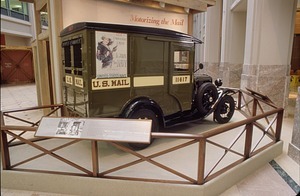 A 1931 Ford Model A Mail Truck is displayed in the Atrium Gallery, National Postal Museum, in the "Motorizing the Mail" exhibit. 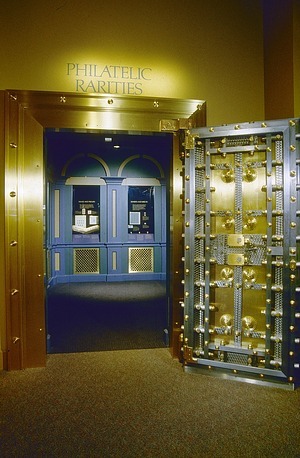 The entrance to the Philatelic Rarities Vault located in the National Postal Museum in the Old Washington City Post Office Building. Visitors to the National Postal Museum, located in the Old Washington City Post Office building, view stamps in the "America's Stamps" exhibit.